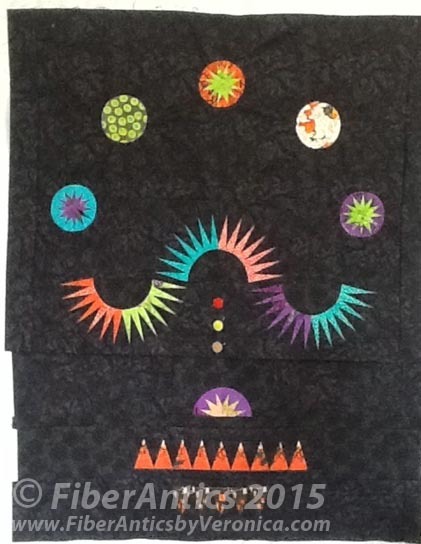 "The Juggler" quilt top before quilting. 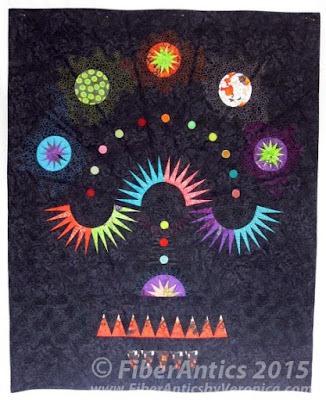 This is Part II of the back story for my 2015 Guild Challenge entry, "The Juggler." Part I can be found at this post. 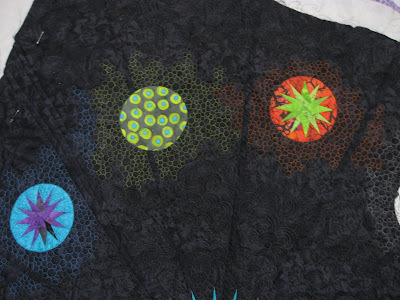 After settling on the layout of the blocks and triangles, the paper pieced "juggling balls" were reverse appliquéd to the background. Radiating lines (ruler work) with a pebble filler. More pebbles surround the outlined paper pieced spikes. 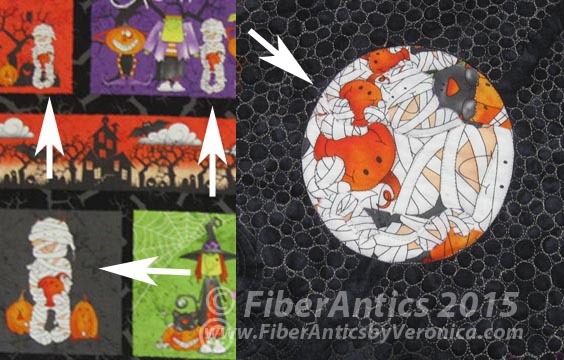 Here is a detail of how pieces from the panel (mummies and pumpkins) were collaged to form one of the juggler's balls. 75% of the panel had to be used on the quilt top. Collaged circle with pebble filler. 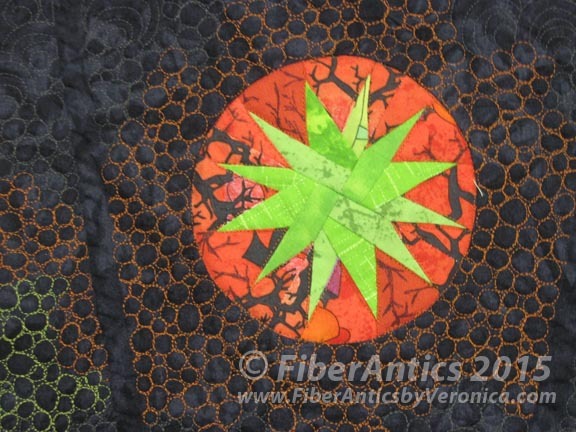 Two more paper pieced star-balls using fussy cut areas from the panel. 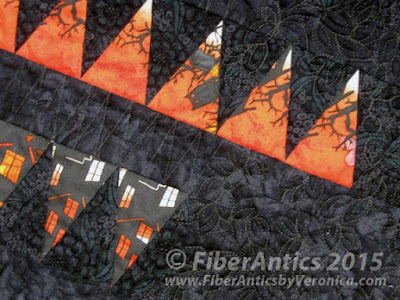 for the paper pieced stars. 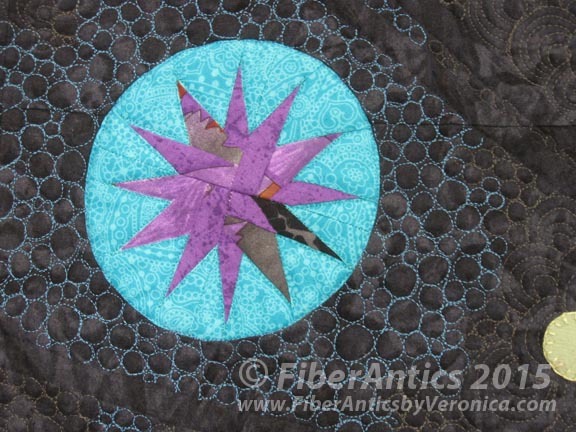 Another paper-pieced star. You can see bits of the Halloween images from the panel. 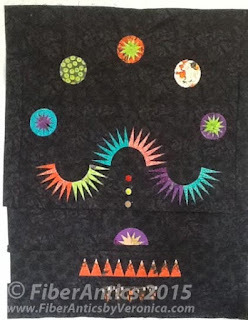 Free-motion quilting around the strip of triangles. Hand appliqué and decorative hand stitching: Upon completion of the machine quilting, the binding was also attached by machine. The felted wool circles were then positioned, basted and hand appliquéd with my new favorite thread for hand stitching—a No. 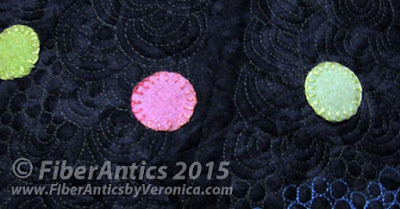 8 perle cotton Eleganza by WonderFil Threads—using a buttonhole stitch. I enjoyed matching up solid and variegated threads to coordinate with the multi-colored wool circles. 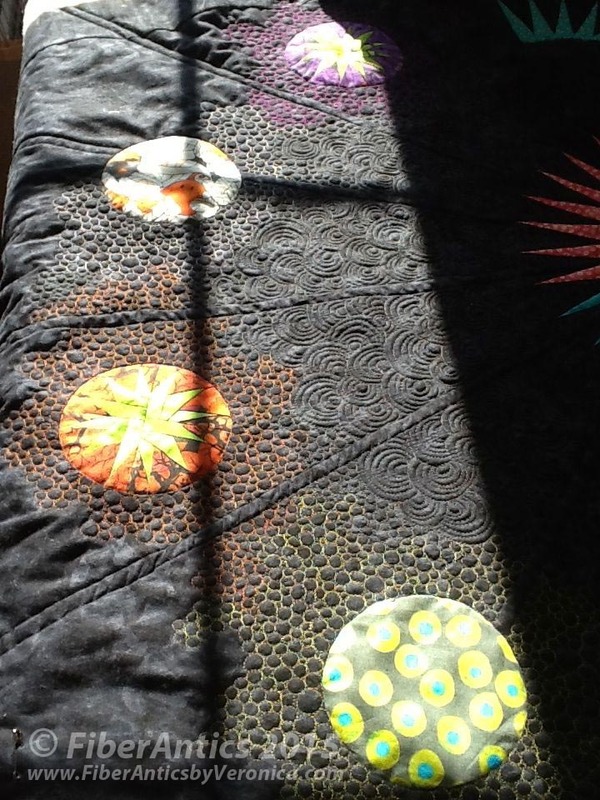 Hand appliquéd wool circles were attached after machine quilting. 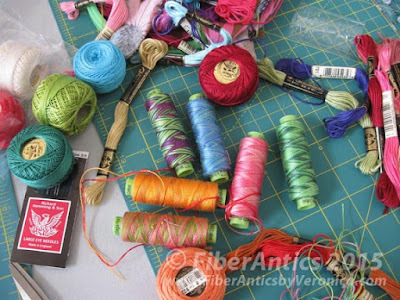 Perle cotton threads and embroidery floss for hand stitching. 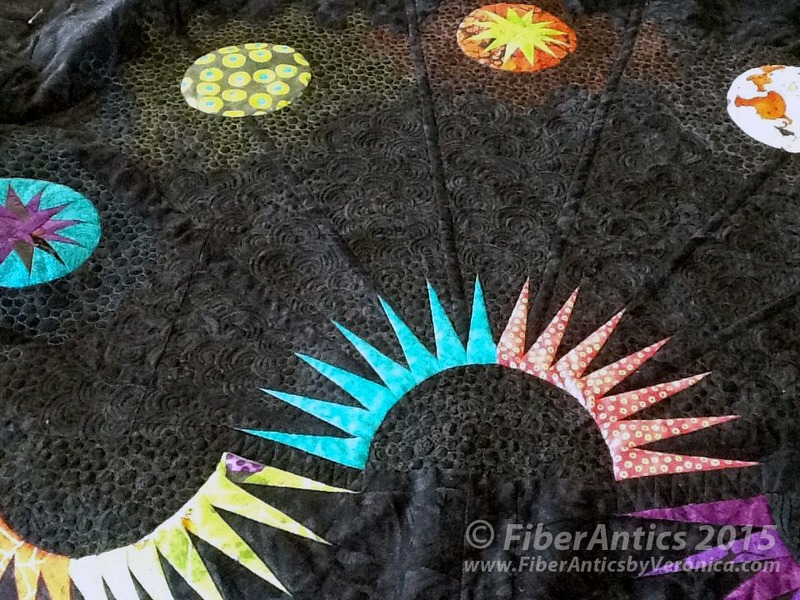 3 hours hand stitching and appliqué 14 wool circles. Bobbin: Bottom Line 60 wt. polyester. Finished quilt size: 39.5" x 48.5"
"The Juggler" was voted First Place, Viewers' Choice, at the 2015 Choo Choo Challenge. Thanks, Sharon. It was a good Challenge and the guild members turned out some great quilts.